NYC, 04/25/2019, 6:30PM. Makala (2018): Everyday Life in Congo. 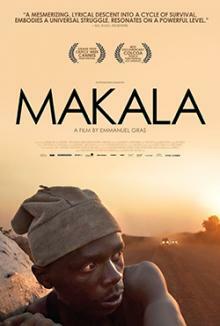 Makala is an extraordinarily revealing and surprisingly gorgeous look at everyday life for a charcoal salesman in the Democratic Republic of Congo. French documentary filmmaker Emmanuel Gras follows 28-year-old Kabwita Kasongo through the entire process of making and selling charcoal: finding and cutting down a tree in the vast plains near his village in the southern region of Katanga, burying and burning the wood to create charcoal, loading multiple bulging bags of charcoal onto a rickety bicycle and walking it several days to the city of Kolwezi, where he hopes to sell his merchandise on its markets and streets.